ORANGEVILLE, ON – Hockley Valley Brewing has announced the launch of a new series of special seasonal bottles from its Midland Beer Works imprint that will celebrate and commemorate various legends and ghost stories from Georgian Bay and the surrounding areas in Ontario. Kitchikewana was known for his great temper, and his tribe decided the best way to calm him was with a wife. They held a grand celebration, and many women came. Kitchikewana met a woman named Wanakita here. He decided that this was the woman he wanted to marry, and started planning the wedding immediately after she left. But when she was invited back, she told Kitchikewana that she was already engaged. Enraged, Kitchikewana destroyed all the decorations, running to one end of Beausoleil Island and grabbing a large ball of earth. Running to the other end, he tossed it into the Great Lakes. Thus, the 30,000 Islands were created. The indentations left behind by his fingers form the five bays of Georgian Bay: Midland Bay, Penetang Bay, Hog Bay, Sturgeon Bay, and Matchedash Bay. He then lay down to sleep and sleeps there still as Giant’s Tomb Island. The beer being featured in the series in an amber ale that Hockley Valley’s Tom Smellie indicates is essentially the same as the flagship Hockley Amber, although it may be “tweaked” for future installments. 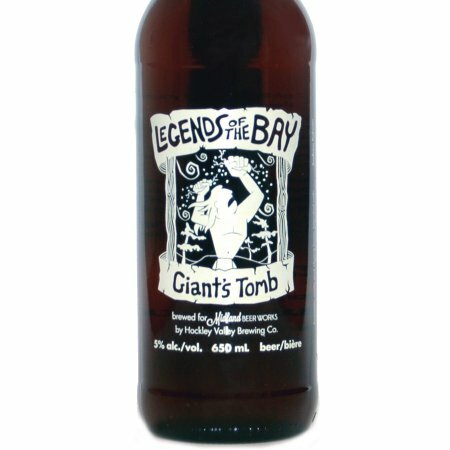 Legends of the Bay: Giant’s Tomb is available now at select LCBO locations in Ontario, retailing for $5.95 per 650 ml bottle.